Garden in the Snow with Wildflower Seed Balls! Home Guerrilla Gardening Garden in the Snow! Seed ball planting in the snow. It’s a great way to beat cabin fever! It’s mid-January as I write, and a stiff breeze buffets snow around the naked stems of grass in my nascent prairie restoration project. I am SO looking forward to spring! But the snow isn’t going to keep me from gardening. Maybe the cold will. There are many native US wildflowers and grasses that need only a litte cold weather to help them germinate in the spring. Mid-winter is a fine time to seed bomb these guys. The trick is to poke them into the snow so that they are in contact with the ground. 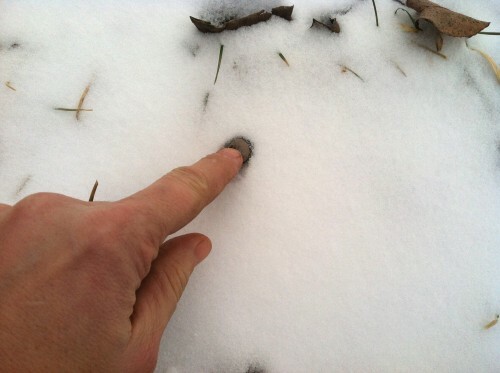 In much of the US, the snow comes and goes, so there are plenty of opportunities when a seed ball can be poked to the soil surface. If you’re in Truckee with epic snowfall, well, it may have to wait for Spring.